Back in the days when Madchester was raving and all indie bands were being remixed, Andy Weatherall was riding high. His remixes for One Dove were hot and I especially remember stories of how his Sabres of Paradise takes of Espiritu's "Conquistador" were changing hands for £100 (whether that was true or not, you can now get them for 99 pence). Silliness. Flowered Up were a Happy Mondays-a-like, but Weekender was an epic track with a memorable short film for the video, and Weatherall's 'Audrey Is A Little Bit More Partial' mix now sounds much like an epic garage track; it's nearly 17 minutes long and has a great change in tempo in the middle, just like some of Johnny Vicious' best mixes. I'm a sucker for a long mix, and a tempo change, so rediscovering this was a pleasure. 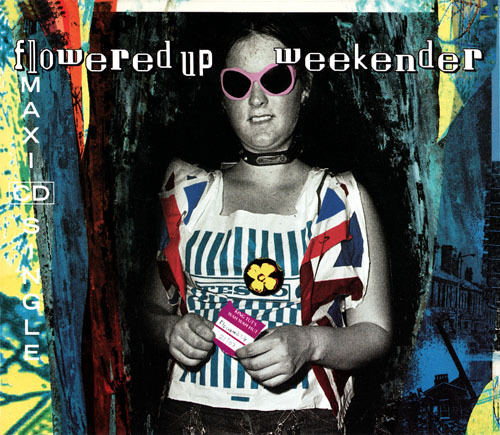 If you fancy a bit of house-not-house, garage-not-garage, disco-not-disco, call-it-what-you-will-but-I-think-it-was-pretty-groundbreaking-then-and-still-amazing-now, you can download Flowered Up "Weatheral's Weekender (Audrey Is A Little Bit More Partial) here (31MB). One of my all time favourite Weatherall remixes...the word 'epic' often gets applied to any track around this length, but often its nothing more than the track endlessly looped....the true test is the dancefloor and very few tracks of this length can be played in full and this is certainly one of them...the way Weatherall plays with the groove, weaving the piano & vocal parts in and out as various sections are dropped in and out...and the drums!the drums! I stupidly got rid of all my vinyl years ago and the best digital rips I have got of both his mixes of Weekender are 160 and slightly muffled so I was overjoyed when I saw this! Its so good to once again hear it in high quality, it sounds like the electric guitarist is riffing his heart out next to me! Its amazing though that you can get this on Discogs in mint condition from five or six pounds....if I had a record player still I would buy a copy again on the spot, so weird how its seldom mentioned in any depth when the Weatherall mixes are discussed. Do you have a rip of the other mix, the 14mins 50s "Weekender (Weatherall's Audrey Is A Little Bit Partial Mix)"? If you do, it would be so good to hear that in such high quality and actually they are very different sounding. Thanks again, you have made my day!